If you currently have a carpenter ant infestation that requires immediate attention, please follow these steps for online checkout. You may also call our office and speak to a representative. Our Cooper Carpenter Ant System is designed to eliminate carpenter ant infestations and prevent carpenter ants from entering your home. When one of our state-certified Cooper technicians visits your home, they will conduct a thorough inspection both indoors and outdoors to determine the breeding sources that are causing the carpenter ants to enter your home. After our technician identifies the root of the problem, they will treat around the foundation on the exterior of your home to create a protective barrier, preventing additional carpenter ants from entering your home. Additional targeted treatments may be applied indoors if our technician determines that further treatments will best resolve the issue. 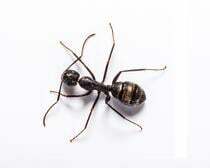 Why Choose Us for Carpenter Ant Removal? Carpenter Ants are also included in our residential home services. "Cooper solved my carpenter ant problem and the online checkout was so easy. I am so happy that I hired them!"